Image slider for web page, this is what most of them searching for make their static web site with more animation and attractive, that's why i'm going to make a small web slider with more animation effects. such as fold, slice, boxrain, fade, etc.. here i'm going to use novi slider jquery to make this image slider. this very flexiable and well supported image slider for all kind of web. let's try this image slider. yeah, in this image slider makes the slider more effective and attractive. it has more animation effects. we can make it as single and multiple effects. 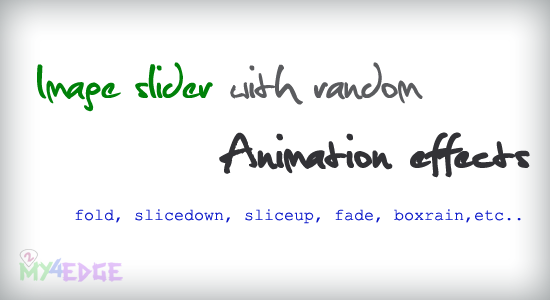 let me explain the details about the code of image slider with animation effects. as like the above just call the image with img tag, and the title will be comes as caption of the image. this is also comes in the same page. here we are going to use nivo.slider.pack.js. you can get clear idea from what i have given in the comment line after the double slash, you can modify the above all as what you need. here the css is also holding the main part with this image slider. you don't want change the css. if you want to mofity something as you need. you can change it. that's it. enjoy. i hope this is very very useful to everyone.